Prickly Lettuce, also known as Wild Lettuce and Lettuce Opium, is commonly found growing wild throughout North America where it has become naturalized. Prickly Lettuce is pain relieving in general and especially when mental anxiety is involved. It relieves tension, especially in the musculoskeletal system, and is calming to the nervous system. Called Lettuce Opium for its use in helping treat people with opium addiction as it has a similar hypnotic affect but without being toxic or addiction forming. 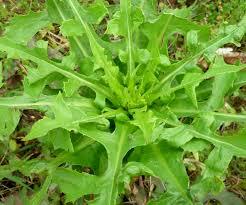 Wild Lettuce is also a sleep aid, helping with insomnia and encouraging dreaming. Prickly Lettuce is best used as a fresh plant tincture as its medicine is contained in the latexy innards of the stem. This latex degrades when drying. To make a tincture of prickly lettuce harvest the top of the plant (approximate the top 12 inches) before it has started to flower and on a sunny day. Immediately processes the plant into a tincture. For more information on Prickly Lettuce check out this article. Cautions/Contraindications: Use with caution with deficient stomach HCl and depression. May cause drowsiness so take caution with driving.